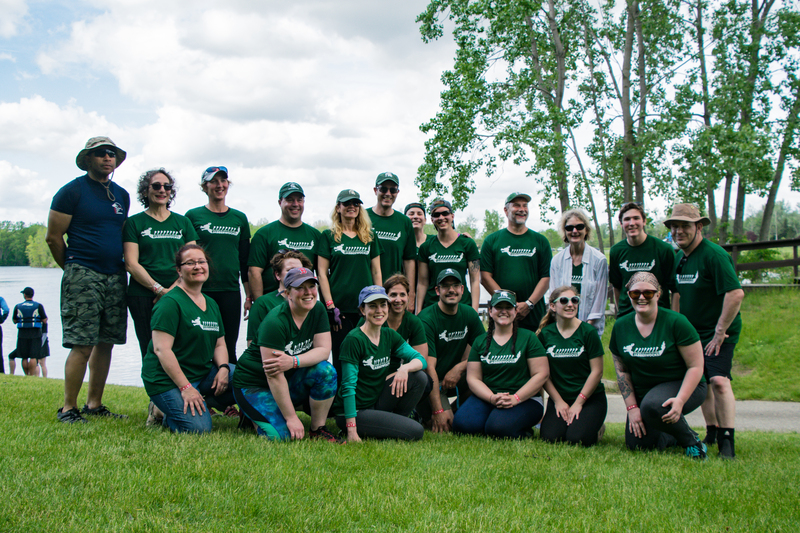 None of us knew quite what to expect on Saturday as we gathered at Hawk Island for our one-hour training session for the Capital City Dragon Boat Race to support the Women’s Resource Center of Greater Lansing. 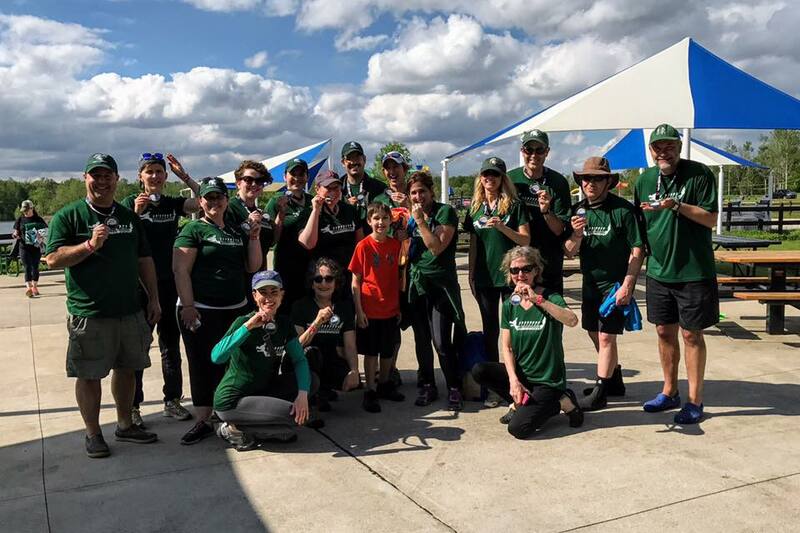 Earlier this year, my wife, Val, suggested that the MSU College of Arts & Letters might pull a team together for the race, and she and Melissa Staub, Executive Assistant to the Dean, had been organizing our team, the Jabberwocks, for a few months. But no one on our team of faculty, staff, students, family and friends had any real experience racing dragon boats, so we arrived at Hawk Island for training with plenty of enthusiasm, but little understanding of the intricacies of the sport. Then we met Mark Robinson. As luck would have it, he was assigned as our steersman for the training session. He was just the person to guide us along a path to success. 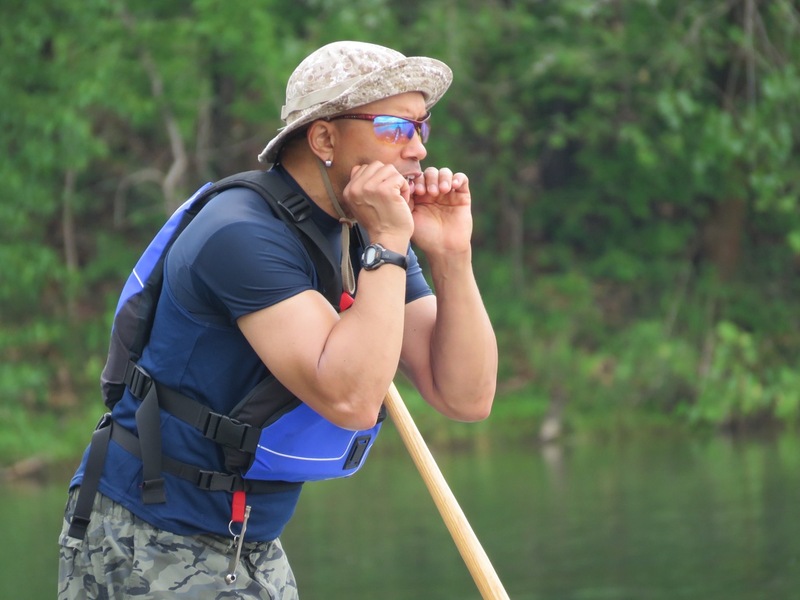 Before we knew what was happening, he was commanding us to “bury the paddle,” keep our “eyes in the boat,” and “watch your lead paddlers,” as we learned how to work together as a team. So began an experience that focused and refined the way I think about leadership, how to create shared vision, and what it means to be a member of a team. Dragon boat racing is like any successful collaborative endeavor, it depends less on individual strength than on coordinated effort oriented toward a common goal. One of the first things we had to do was commit ourselves to be in the moment, to fully be there together with one another in the boat. Each of us had to focus on what we needed to do to be successful as a team. We could not worry about what the other boats were doing or concern ourselves with the weather; but rather, we had to focus on our individual part in a greater whole. For me, in the second row, this meant matching the formidable pace Maddie Shellgren, a College of Arts & Letters graduate student, was setting in the lead row. With each stroke, I tried to match her pace, focusing on the stroke I was making, how the paddle enters the water, reaching a bit further, pulling a bit harder — each stroke became an opportunity to be a little better than the last. Each stroke had to be in sync with Maddie’s. A dragon boat is made up of different sections, a flag catcher, drummer, the two lead paddlers and two rows of pacers, the middle three rows make up the engine room, while the last three are the rockets, with the steerman in the back. Each of us had a role to play: focus on the lead paddler, stay in sync, paddle together, bury the oar in the water, pull close to the boat, repeat. Balance and synchronicity are critical to success. Each of us needed to lead from the position in which we were situated; each of us needed to improve our form with every stroke; and each of us needed to find the energy — after so many heats and so many strokes — to give a little something more to the cause. When the boat begins to move and pick up speed, when the water begins to buoy us and we are moving together as a team, it’s exhilarating. It was quiet and still out there on the far side of the lake; we were all together in the boat, attending to the moment, focused on a common goal. We could see what we had to do, we each understood our role–focus, intention, coordination. Timing beats strength every time. None of us knew quite what to expect last weekend when we gathered at Hawk Island; we certainly didn’t expect to win a gold medal; but now we have all come to expect something more of ourselves and of our shared efforts to weave what we learned into the life of the College; and we know too, that when people come together to support an important cause, great things are possible. Thanks to Jennifer Desloover for the amazing photos! Great article and experience. This event really is a great team building exercise and you captured that here so nicely. Thank you so much for supporting the Women’s Center. We are so glad you had a great time! If you are hearing about this event for the first time, please consider being a part of it next year. It is one of the Center’s biggest fundraisers of the year and we depend on donations, grants and fundraising to keep out mission going.